When the Coalition was formed in 2010, Francis Maude, Minister for the Cabinet Office and Lord Browne (at the time the Government’s Senior Non-Executive Director) identified a lack of high-quality, comparable Management Information (MI) as one of the main factors preventing the Civil Service from delivering on its reform agenda. Put simply, the lack of this data meant it was impossible to see reliably how different parts of Whitehall were spending public money. The Quarterly Data Summary (QDS) was launched in 2011 to provide functional information and performance metrics that were not readily available from other sources. Since then, it’s evolved significantly to the extent that it now collects around 1,500 data points from over 50 of the largest departments and agencies. Data from QDS now regularly informs decision-making by Ministers in a variety of different ways - from comparing the efficiency of fraud strategies to tracking the savings and efficiencies delivered by shared services. And we’ve also gone further by opening up our MI to other departments and to the public in new and exciting ways. 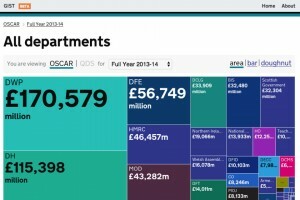 In 2013, the Government Digital Service (GDS) helped to develop an internal tool to visualise all the information collected via the QDS – the Comparative Analysis Tool or CAT. This is a tool for internal Civil Service use, as it contains functional and programme budgets, forecasts and other information that is commercial in confidence. The CAT enables hundreds of users across government departments and agencies to create visualisations in a few clicks, compare themselves against the peers they deem relevant and identify trends over the past 3 years. They can also download the entire dataset and use it for their own bespoke analysis. A crucial driver of the CAT’s enthusiastic take-up in organisations across central government is the fact that it is a tool that they can use as they wish - for example, some use it to monitor staff sickness absence rates, others procurement spend with SMEs. The vast majority of participants in the QDS process now regularly use charts or information from the CAT in board meetings. We’re now expanding the CAT so it can also visualise other types of MI beyond QDS and give decision-makers in government access to insightful information that is clearly presented. 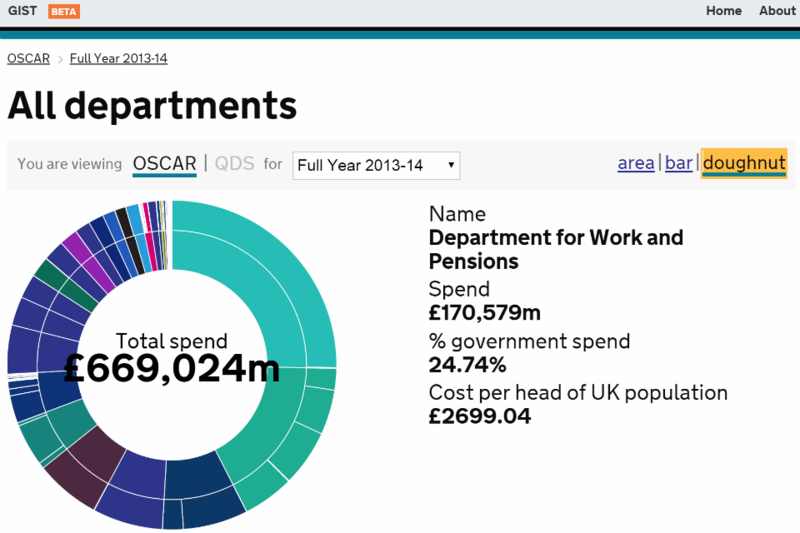 In June 2013, the Cabinet Office and GDS also launched a public site: the Government Interrogating Spending Tool or GIST. This attracted strong interest from the public and media, and the Telegraph liveblogged its launch. 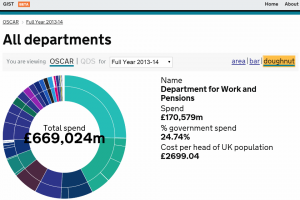 GIST allows users to manipulate quarterly and annual government spending information from both Treasury and Cabinet Office sources, including QDS and OSCAR, in an intuitive manner and drill down into areas of interest. It also gives them the option to download the complete datasets that power the site, so they can reuse and analyse the data in innovative ways. A number of governments around the world, including other digital leaders keen to bring transparency to life in an accessible way, have asked us to share our experience with the GIST. For the first time, the QDS provides government with quality-comparable MI on crucial areas of spend and performance. The changes in culture brought about by the modern, digital tools we’ve created have been just as transformative. We’ve empowered civil servants to share data and learn from each other in new ways, encouraging transparency and giving the public a more intuitive way of scrutinising government spending. In future, there is a real opportunity to extend this approach to look at outputs and outcomes as well as inputs and to further harness the power of MI to help Whitehall continue to improve its delivery and transparency. Benchmarking and other forms of comparative analysis will be key to enshrining values of openness and learning from each other, as well as helping drive greater efficiency. We are building other important platforms too - the Performance Platform, for example, which captures data about how digital services are doing. If you have any feedback or questions or would like access to the CAT, please get in touch with the MI Team in the Cabinet Office.